Croatian Wine - More than just a Drink! When we start talking about wine, things maybe get complicated, sometimes serious. Some people imagine serious old man doing their tastings. It is a difficult topic. At the end: Wine is just a drink for adults and should not be taken seriously. Since Croatia does not produce the quantities of wine Italy, France, or Spain do, Croatian wines are more or less not well known. Since the quantities are usually small and the regions not well known you don't have to pay for the name, like you usually do for wine from famouse regions (Bourgogne, Champagne, Rioja, or Napa). In general you can find some amazing wine, still relatively cheap. We would like to give you a list about - in our opinion - most popular Croatian wines. The berry is thick-skinned and has a solid structure. It is a dark wine, ruby color with deep blue reflection, nicely developed scent, aromas include blackberries, dark cherries, pepper, and spices; it is a vigorous wine and tartly with specific flavor. Plavac is the most significant Croatian autochthonous wine. Dark ruby color with purplish shades, dark forest fruits on the nose with some hints of spice. On the palate, the wine is rich and fruity with a nice structure and lengthy aftertaste. The wine is made from the grapes of the variety Plavac Mali. Deep, dark color, earthy and pungent, with crisp acidity, biting tannins and distinct notes of ripe berries and a pinch of pepper. Babić is a native Croatian wine, typical for Northern Dalmatia. Its history is largely unknown, except the fact that is cultivated in Dalmatia for hundreds of years. currant, cherries, mixed with sweet and ripe flavors of jams and dried plums) and after a while the wine brings out the scent of herbal aromas (mint, black tea, mild pepper, fennel and coffee) Dingač is a top quality red dry wine, which has a controlled origin from limited areas of Pelješac peninsula. Dingač was protected by Geneva Convention in 1961 and became the first Croatian wine that is protected by law. and delicious, with a gentle bitterness. Pošip is an autochthonous white wine grape that is cultivated on the island of Korčula in Dalmatia, and some small amounts are cultivated on the Pelješac peninsula. Its history is largely unknown, except the fact that is grown on the named areas for a long time. Light-skinned berries, has a high level of acidity, possess a slight herbal aroma, flavors of ripe pears which offers a creamier texture. Maraština is an indigenous Croatian wine, made of the Maraština grapes, which has almost disappeared. It can be found from Prevlaka to Croatian coast and on the island of Korčula and Pelješac peninsula. Green-yellow color with a shade of gold, with various aromatic components, depending on a sort, it can possess flower-fruity aromatic potential, reminding on acacia flower scent, a flavor of apple, plum and apricot, and in ripe wine a taste of bitter almond is present Malvasia, most likely originates from Greece, which came to Croatia during the Middle Ages. Today it is mostly cultivated on the Istria peninsula. originates from Central Europe, but its presenr in Croatia for decades that many people think of it as an autochthonic. It is one of the most popular white wines in Croatia. northern and central Croatian coast. Soft and very pleasant aromas, combinations of gently fruity aromas (apple, ripe citrus) with the notes of meadow herbs with flowery tones, lower acidity (easy drinking wine) Žlahtina arrived to Krk Island in 1980s, and it is a product indigenous to Krk island. Today it is cultivated exclusively in the vineyards near Vrbnik. Sweet desert wine, copper dark yellow color, divine bouquet, highly sweet, yet possess residual fresh acidity of grape, and despite of sweetness it seems light and refreshing. Prošek comes from the word Prosecco, which means dried. 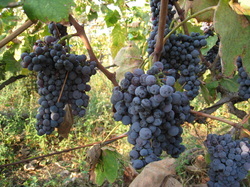 It is named that way because the special way of preparation (the grape is dried). It is mostly cultivated in the northern Croatian coast (mostly Istria peninsula).